I’m Juliet and I work in the ‘Send data to DfE’ project. It used to be known as Data Exchange. DfE collects all different kinds of information that’s then used to influence education policy and delivery. We’re currently working on a project to improve how we collect this data, especially to minimise the burden on our data providers (such as schools, multi-academy trusts (MATs) and local authorities (LAs)). Our ambition is to provide a consistent service for sending data to DfE and, where possible, to automate the flow of data from a school management information system to DfE, reducing the amount people need to do themselves. We’re doing this using APIs, and to the uninitiated, API stands for application programme interface (API) and it’s a set of commands and formatting of those commands that one programme or system sends to another. Systems connected with APIs can be given permission to talk to each other without the need for any user knowledge or intervention. We’re starting with moving and validating school census data. To be a successful service Send data to DfE needs to work for all our users. We’re working hard to understand and respond to what our users need. We have several different kinds of users – so we’ve been talking to the different groups and exploring their needs. School management information systems suppliers are helping us understand how ‘Send data to DfE’ could be integrated into a school’s management information systems, so that their schools have the best user experience when using our service. We worked with a small number of suppliers to validate and submit test data using our prototype service and APIs. We then made changes in response to their feedback. If you are a management information system supplier working with schools and you’d like more details about the Send data to DfE service (formerly known as Data Exchange) please contact us. We visited schools to observe the current processes they have to go through when submitting their school census data to DfE. It was really insightful to see how much time schools spend correcting and cleaning the data in their management information system, and then spend more time correcting new errors and queries once they load the data into DfE systems. We’ve also been talking to our colleagues inside DfE: the DfE data collection helpdesk support schools and LAs with census returns. They showed us how census data moves through DfE systems – from initial submission, through checking and to completion. We learnt more about the errors and queries that occur, why they happen, and how the team help to resolve them. Now we’ve spent time with our users to identify their needs when validating and submitting census data, we are designing the service to meet those needs. We have proved the technology works using test data, and management information system suppliers are happy with our design. Now we are going to work with a small group of volunteer management information system suppliers and schools to test the service using school census data. We will also check that this data matches that is sent to DfE’s existing systems. We have to make sure all parts of the service are intuitive and easy to use and that we provide users with the right support when needed. ‘Send data to DfE’ needs to streamline the process for submitting data by allowing schools to check and validate their data in their own system. We also need to have the right data checking processes at the right time, so that we get accurate and complete data returns. We are also working closely with other internal projects to make sure they can use our technology to make improvements to financial reporting and how DfE stores data. And of course, we will keep talking to all of our users to make sure the service meets their needs! If you would like to receive regular updates about Send data to DfE please contact us. 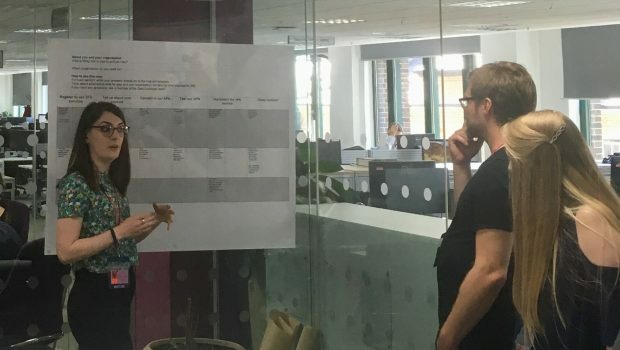 When DfT came to visit: "What we learned about agile from DfE"
Sounds like you're off to a great start - no doubt that users will greatly appreciate the usability and data checking improvements you are planning, to make their lives easier.